A demat account holds stocks electronically. It acts as a warehouse and is linked to the trading account and serves as a link between the bank account and trading account. Technology has helped humanity take a giant leap forward in changing the world. The stock market is no exception to this. Previously, stocks used to be traded in certificates. However, there was an increased risk of physical damage or theft. With the advent of technology, this problem has been tackled through the Demat account. Demat stands for dematerialized, i.e. something which is not tangible. Hence, a demat account holds stocks electronically. It acts as a warehouse and is linked to the trading account. It serves as a link between the bank account and the trading account. In case of shares, you need both a trading and a demat account. A demat account gives information only about the number of shares you have and not the profit/loss you made. Step 1: To open an account, you need to fill the account opening form of a depository participant (DP). CDSL (Central Depository Services India Pvt Ltd) and NSDL (National Securities Depository Ltd) have a list of DPs on their site. Step 2: You need to submit photocopies of your address and identity proofs along with your account opening form. Step 3: An agreement needs to be signed with the DP stating the rights and duties of both parties (investor and DP) in a standard format. You will get a schedule of charges and a copy of the agreement. 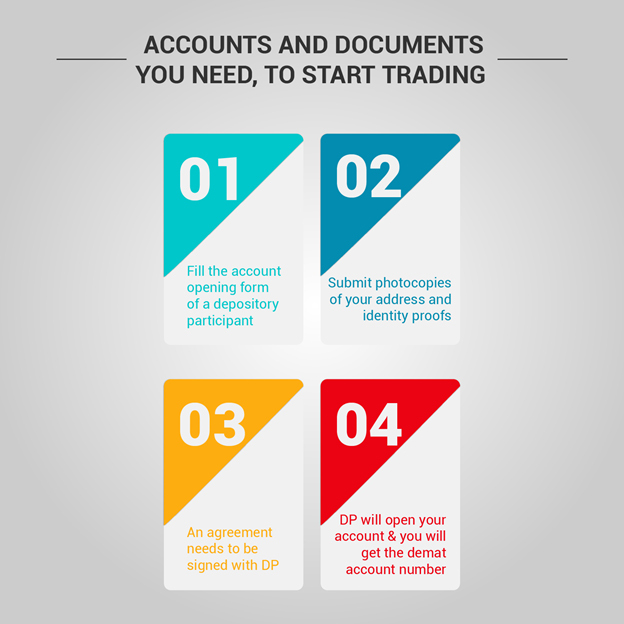 Step 4: The DP will open your account and you will get the demat account number. All your transactions will have this demat account number for electronic trades. Gives trading freedom, i.e. can trade from anywhere as long as you have an internet connection. You should update your bank account number and postal address as you will get your dividends, interests, and redemption payment, along with the annual reports of various companies at your correspondence address.